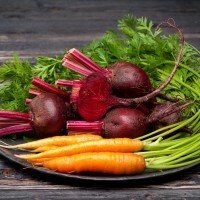 This is a wonderful recipe to use up those fresh-from-the-garden beets and carrots. Its an awesome side dish to bring to cookouts and potlucks and holds up well to use as leftovers. Don’t like cilantro? Fresh parsley works well here, too! Mix first six ingredients in a large bowl. Add beets, carrots, and cilantro to dressing mixture and combine. Let marinate an hour or more.